Jealousy. Cranky, burning jealousy is how a lot of home automation products make me feel. I’m sure the Nest thermostat is a neat device to use…if you have a thermostat, which I very much do not. Likewise, I’d love to test out the Goji Smart Lock next year, but my Luddite boyfriend is still rocking a feature phone, which rules that out too. So I was excited to set up Viper’s Home Starter Kit even if just to see how successfully I could automate the security of a mostly analog house built in 1908. And after nearly four weeks of testing, over 4000 words and 12 pages of notes on all the tinkering and testing, I had the Viper Home Starter Kit running exactly as I wanted. Here’s the nitty gritty on what was good, what was frustrating, and what was confusing. The four-piece Home Starter Kit. Viper claims its Home Starter Kit can be set up in about 15 minutes, and on the hardware side, I found that to be true. 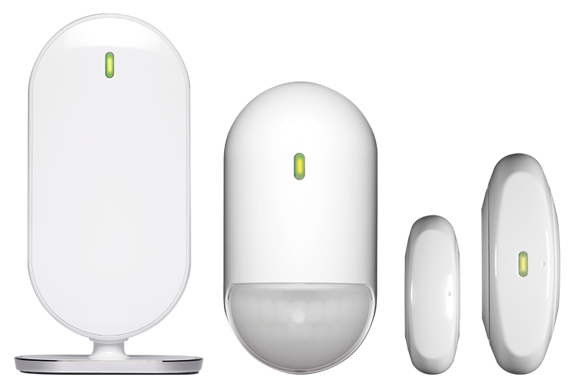 The Home Starter Kit consists of the Smart Hub, one Motion Detector, and one two-piece Magnetic Door/Window Sensor. I additionally had an Indoor Siren ($49.99), a Wireless Camera/Motion Detector ($149.99), and another Magnetic/Door Window Sensor set ($24.99). Viper also sells a Remote Control Key Fob, which comes in particularly handy if someone in your house doesn’t have a smartphone.